Welcome to the guide to gift collections within the Gordon W. Prange Collection! Though the Prange Collection is known for its Japanese print publications, it also contains gift collections that include manuscripts, photographs and oral histories that document the personal and professional lives of Americans who served in Allied Occupied Japan. Materials from the Gordon W. Prange Collection are accessible in the Maryland Room, the reading room for Special Collections and University Archives at the University of Maryland. Researchers should visit the Maryland Room, located on the 1st floor of Hornbake Library North, to view these items. 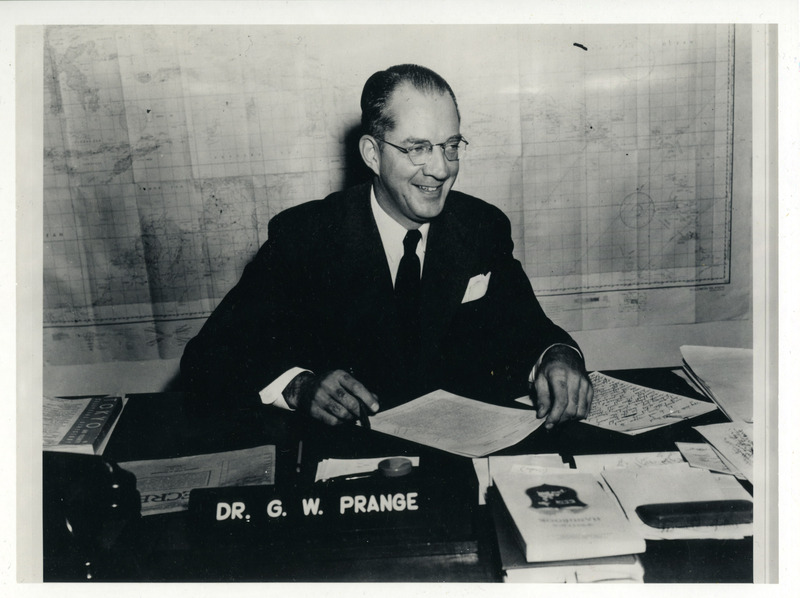 The Gordon W. Prange Papers may be used in the Maryland Room on the first floor of Hornbake Library North. Materials may be requested fur use online. Included in the collection are notes for early writings on Hitler; interviews with Japanese and American military figures involved in Pearl Harbor and the Battle of Midway; correspondence with friends and publishers; drafts of books and articles; and lecture notes from University of Maryland classes. The collection also contains approximately one hundred maps and charts relating to Pearl Harbor and other World War II battles. An accession of addenda acquired in 2009 consists of photocopies of original documents from the University of Pittsburgh Donald M. Goldstein Papers, which include Prange and Goldstein's research files. Additional related materials are located in the Donald M. Goldstein Papers at the University of Pittsburgh. For more information, contact us or call 301-405-9212.